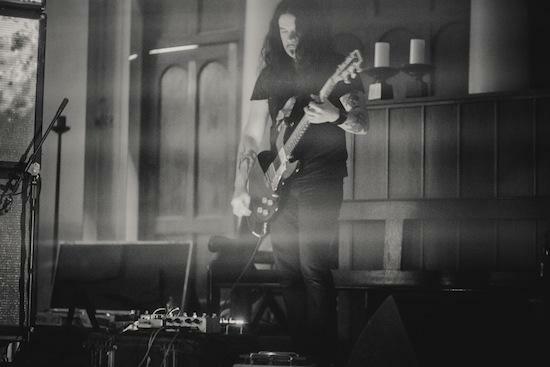 Stephen O'Malley has become increasingly interested in the spatial/acoustic potential of his/Sunn O)))'s brand of sonic insurrectionism. 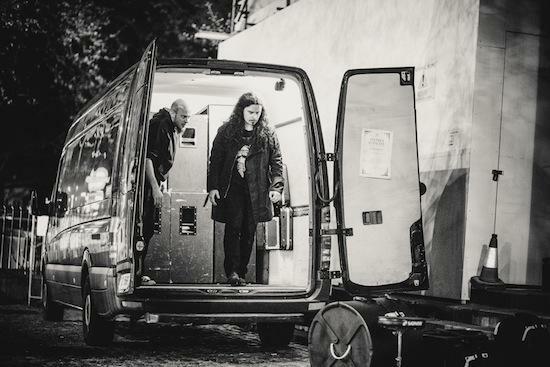 Whether it's his formative appreciation of Keiji Haino (and his privileging of space over tone) or the multi-channel spatialisation work for the Gisèle Vienne-directed theatre collaborations (under the KTL moniker), O'Malley has increasingly sought to fashion a live experience that explores/exposes the limits of space and place as much as duration. On Saturday, the setting of St John at Bethnal Green provides as good a frame as any for such an architectural analysis. O'Malley has often discussed the insular self-reflection/self-examination that these relatively nascent live solo performances allow him, and tonight is no different. 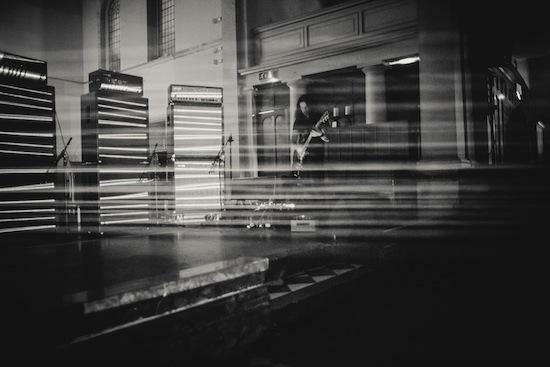 Standing to the right side of the stage, letting the amps take centre stage, he presents a one-hour performance that is a markedly different beast to his work with Sunn O))): simultaneously less tightly structured in its ebbs and flows, yet with a distinct sense of pared down simplicity. 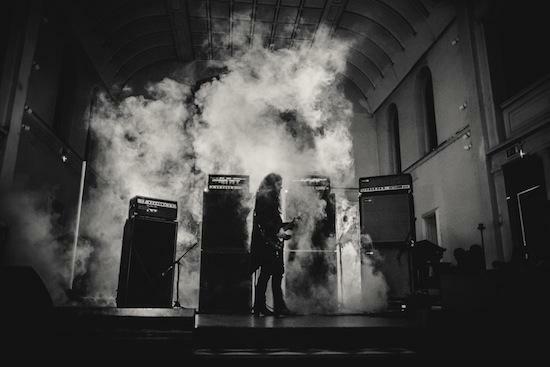 The lack of distinctive rhythm/percussion within the Sunn O))) catalogue is usually banded about as some kind of demarcating USP; however, when you dig a little, much of their material is infused with rhythmic progression (particularly on the Attila Csihar collaborations). However, along with Sunn O)))'s 2014 demo LA Reh 012, O'Malley's live solo work is perhaps the most truly arrhythmic work he has produced to date. The chord progressions are achingly slow; hanging in the air as the space of the building fashions it's own rhythmic reverberations. 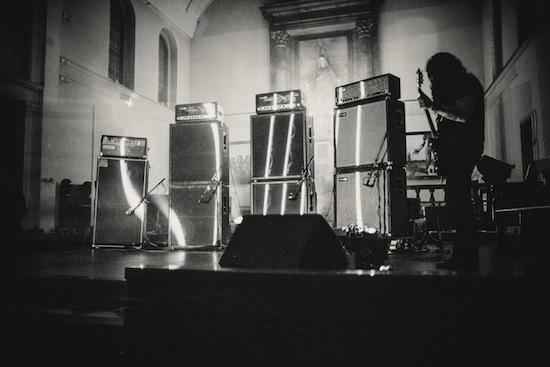 This is not to say that the set up tonight doesn't share some sonic and aesthetic affinities with Sunn O)))'s live performances. Where the KTL theatre work utilises a 14-channel speaker system with four subwoofer stacks – enveloping the audience to a degree – O'Malley keeps everything front and centre tonight, in a more assaultive approach. As the reverb builds up and up, I try to think which of O'Malley's projects had most informed this new solo work. However, the slightly more freeform structure, alongside a progressive simplicity, doesn't lead me back to O'Malley, but rather invokes the generative influence behind Sunn O))): Earth's 1993 Earth 2: Special Low-Frequency Version. It seems to me that beyond O'Malley's electronically informed side projects (ÄÄNIPÄÄ, KTL, Æthenor), lately he has been aiming at a brilliantly regressive refinement: a return to the roots of drone. As O'Malley himself has suggested, “[playing solo is] much more like an investigation of certain details of your playing style that you want to go further with, but when you're in front of an audience being put on the spot is quite good, I think, for being truthful in the investigation and not getting waylaid. The geometry of sound form, that's the sort of large-scale time exploration. Harmonic dissonance. Patience.” Long may it continue, in whatever shape, space and incarnation.